Although I am not a huge fan of Shakespeare's Romeo and Juliet (don't shoot me, some of his other plays are just better), I do love retellings of classic stories. This book reimagines Romeo and Juliet's entire story, placing them both in a new light and adding a paranormal twist. Seven hundred years ago, Romeo murdered Juliet so that he could become immortal. But Juliet didn't die; instead, her Nurse offered her a new life. She became part of the Ambassadors of Light, a group who works against the Mercenaries to preserve soul mates and true love. But every time Juliet returns to earth, Romeo is there, trying to thwart her and win one of the lovers to the Mercenaries' cause. This time, Juliet has found herself in the body of Ariel, a girl who has had a rough life and been badly hurt by those she thought she could love. While Juliet tries to find the soul mates she has been sent to protect, she also tries to improve Ariel's life and her relationships. But this isn't a routine mission. She never expected to find someone new to love, someone with whom a future would be impossible. Nothing seems to be as it should, and for some reason seeing Romeo again only confuses her more. Will true love win in the end? This story wasn't quite what I was expecting. Instead of being a retelling of Romeo and Juliet, it places the familiar characters in a new setting entirely; however, some of the dialogue from the play does make an appearance, and certain ideas from the original story make an appearance. In this book, Juliet is not the love-struck girl she was in the play. Instead, she is strong and independent, slightly jaded, and someone who doesn't really believe in love despite her constant work with soul mates. When she finds someone she thinks she can love, she fights her feelings every step of the way, afraid of being betrayed again. I have to say that my favorite character in this book was Ben. While Romeo worked for the dark side, Ben was caring, passionate, and sweet. I did enjoy the brief intermezzi from Romeo's point of view, however; they shed new light on his character and added more depth to the story. The book was certainly interesting, with both two different plots running side by side and the mystery and paranormal twist throughout the book. Juliet spent a lot of time frustrated in this book, and as I result I sometimes found myself frustrated as well. Although I understood her reasons for pushing Ben away, it was always sad to watch her do that. However, after the plot twists and changes of heart from some of the characters, I loved the way that everything turned out in the end. 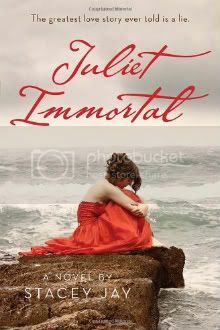 Juliet Immortal is an enjoyable book, one that will take you to Verona and beyond and one that will make you believe in soul mates again. I will definitely be reading more books by Stacey Jay. I love Shakespeare's Romeo and Juliet and have been looking forward to reading this book. Great review! I think I need to read this one. The concept wasn't something I cared for at first but the more I see of it - and reviews like yours - makes me think I need to give it a try!